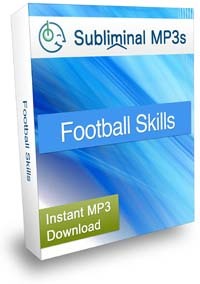 Improve your football skills and become the best american football player you can with this subliminal mp3 audio album. Do you want to improve your game, but feel that you aren't really motivated? Do you often find yourself giving a weak performance where you know you could do better? Would you like a way to naturally develop to your ultimate potential? If you don’t believe and have the mental capacity to know your worth and how well you can do, then you’re not going to reach your full potential either on or off the field. Belief in yourself is the first thing you need to improve in order to improve your game - that's why so many top athletes use mental as well as physical training to achieve their best performance. The lack of belief is what most often causes players to not feel motivated. When you don't believe in yourself, you don't have desire to succeed and to be the best you can - simply because it's a "safe zone": if you don't give your best, you won't be disappointed. If you want to overcome this and to really improve your game and your attitude toward it - then this is the album for you. How can subliminal messages help? This album sends positive suggestions and phrases into your mind to help you improve your football skills. When they enter your mind subliminally, these messages are able to change the way your mind feels about the game and your own potential, deleting the limitations that you put to yourself and motivating you to go beyond your limits. They aren't a magical solution - you have to do the work, and you have to really want this change to happen. But if you do, when you listen to the album regularly, it will enhance your motivation and your belief in yourself, allowing you to get from where you are now to where you could be - naturally! Make you generally more motivated to train. You will be more dedicated to your training and train like never before - going beyond your current limits to develop to your ultimate potential. Help you to become a mentally tough athlete, on and off the field. You will be competing with confidence, moving on from mistakes or setbacks, performing under pressure, playing with trust, and taking risks on the field. You will be able to easily cope with the adversity that comes with playing competitive football. Focus you and make sure you give a consistent performance every time - you will always be in peak condition mentally and play to your best. Play this album every day for a gradual improvement, and use it before training, and your games to ensure the messages are fresh in your mind. Start today!